Following their successful Kickstarter campaign back in 2014, Rockwell Razors rolled out a new generation of stainless steel safety razors. Dubbed the “6S”, this premium razor offered 6 different shaving settings. This approach is ideal for many people given that we can vary in beard growth thickness as well as skin sensitivity. Furthermore, not everyone shaves every day so having multiple settings allows you to choose the closeness accordingly. More recently, Rockwell Razors also released a chrome variant of their flagship razor. The “6C” is a cheaper but almost identical razor that offers the same adjustable concept. In the following review, you will discover the Rockwell Razor brand. You will learn about the difference between both the Rockwell 6S and 6C as well as explore other products that they offer. Firstly, let’s talk about how Rockwell’s concept works. Both the 6C and 6S are adjustable razors meaning that the blade exposure can be changed. This means that the razor blade’s exposure can be adjusted meaning that the shave’s aggressiveness can be changed. Therefore, users have the choice between milder to more aggressive shave settings. However, rather than using the traditional method of a screw at the handle’s base to adjust blade exposure, they work by interchangeable plates. Being three-piece razors, you simply have to disassemble them as you would to replace the blade. Once taken apart, you just have to change the central plate to change the blade’s exposure. Both razors come with three different plates. Each of these plates has a different setting on both sides, which are numbered 1 through to 6. Whilst 1 offers the mildest shave for sensitive skin or daily use, 6 is the most aggressive. This is because it leaves a larger gap between itself and the blade cap to expose the skin to more of the cutting edge. Although it may not be as convenient as a conventional adjustable razor, it does have its own advantages. For instance, fewer working parts means that razor’s longevity is preserved whilst still allowing user to customise his shaving experience. However, it may be trickier for some to change the setting halfway through a shave as you have to take the razor apart. After all, this is one of the benefits of an adjustable razor as you can gradually make the shave milder between passes. Nevertheless, this is what I did when testing the razors as I will discuss later in the review. Outside of pricing and materials, the first and most noticeable difference between the two razors is their presentation. The Rockwell 6S comes in a leather display case, which opens and closes with a magnetic clasp. Meanwhile, the Rockwell 6C is delivered in cardboard packaging. However, this isn’t particularly surprising as the 6S is the premium option between the two at twice the price. Therefore, it’s understandable that Rockwell would go extra lengths one whilst reducing costs with the other. Beyond that, the only noticeable differences are due to the materials used. The original 6S and its plates are made from brushed stainless steel that are forged in the USA. Conversely, the 6C is constructed from chromed zinc alloys with stylish gunmetal finish. Whilst the 6S features a matte finish, the 6C glistens thanks to its polished chrome. Personally, on merely looks alone at this stage, I feel that the 6C has an edge over its prestigious cousin. Still, let’s not judge a book by its cover just yet. In terms of dimensions, both razors are nearly identical with the same knurled handles and various details. However, the stainless steel option features the brand name on each side of the plates whereas the chrome ones are blank. Similarly, the 6C features a slightly narrower handle than the 6S but the difference must be mere millimetres. In this hand, both razors feel weighty. However, the Rockwell 6S feels much heavier. When measured on scales, the 6C is just under 100g whilst the 6S is around 120g. Although the difference is technically minuscule on paper, it’s distinctive in reality. There tend to be two preferences among shaving experiences when it comes to weight. Whilst some the control of a lighter razor, others prefer heavier ones in order to let gravity do the work. Personally, my dainty writer’s hands are more accustomed to the former but I was looking forward to trying something new. I lathered up the Rockwell barbershop scented shaving soap with my Vie-Long horse hair brush. I was particularly fond of this soap as I’ll explore further down. It produced a thick cream with a refreshing scent that was somewhat reminiscent of fennel. 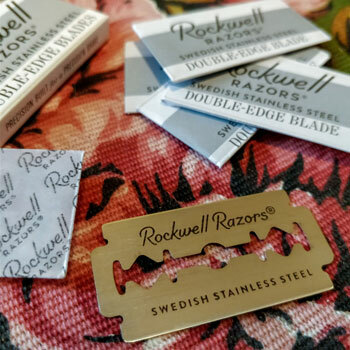 Both razors come with Rockwell’s own Swedish steel razor blades. Therefore, I thought it only logical to use these while testing. As you’ll see later, I found them to be excellent blades with a very smooth finish. Once the soap was fully lathered, I picked out the most aggressive No. 6 plate as I had let my beard grow out for the past week. Usually, I have very sensitive skin so I avoid using aggressive blades or razors. However, for the purposes of this review, I thought I’d give it a try with the Rockwell alum matches close to hand. Nevertheless, my worries were apparently irrational. The first pass was wonderfully smooth and I gaped at how well it removed growth without any irritation. This may not sound like a big deal but my skin easily becomes red and sore when shaving. Here, I felt nothing and my skin seemed perfectly fine. I could hear the razor providing a pleasant audio and tactile feedback as it glided over the skin. Each stroke was smooth and I could really appreciate the razor’s well-spread balance. I was absolutely delighted with the result and changed to a lower plate setting for my second pass. For the second pass, I jumped down to the 4th plate so I could compare the difference. Here, my strokes went against the grain to reduce the stubble even further. In the end I found that changing the plate wasn’t all that inconvenient and the benefits were certainly worth the effort. Again, I enjoyed each smooth pass as it sailed over the stubble. At this point, the beard was drastically reduced thanks to the first plate and I only felt a few vibrations in the razor’s head. Furthermore, I began to appreciate the razor’s longer handle, which allowed me more control when shaving at various angles. However, I did feel that the razor had a slightly bulbous head, which made it a little challenging when shaving the moustache area. However, it wasn’t impossible and I managed to reach all the nooks and crannies. Once finished with the second pass, I changed the plate to the No. 1, which is the mildest one available. For the same reasons as mentioned in my first pass, I never shave against the grain. As my skin is usually quite sensitive, it tends to set on fire when I do this. However, given that I was delighted with the earlier results, I thought I’d risk it. Fortunately, the gamble paid off! The final pass was smooth and refreshing without any discomfort. In the end, I was able to remove any rough patches for one of my closest and smoothest shaves yet. As mentioned earlier, changing the plates wasn’t much of a hassle and provided clear benefits to the overall experience. Honestly, this has been one of the best shaves I’ve ever had with a double edge razor with results that I only tend to get with a straight. Therefore, it may become my daily choice for a while. Funnily enough, I simultaneously listened to Geofatboy’s YouTube video of the Rockwell 6S while shaving with it myself. We ended up following the same approach and it seems that we are in overall agreement with the shaving experience. As for the difference between the two, their final results are very similar. Given that the 6C is almost identical to the 6S, the shaving experience is more-or-less the same. I did feel that the weightiness of the 6S was a bit too much when going against the grain and gravity. However, there are men who prefer a heavy razor, which I can respect. Perhaps it was also my imagination but I found that the 6C’s polished finish reduced friction even more for a slightly better glide. Nevertheless, it’s hard to overlook the 6S superior materials and premium construction. Why Should You Consider The 6S? Despite being twice the price, the Rockwell 6S is a veritable premium razor that offers a unique shaving experience. Forged from stainless steel in the USA rather than abroad, it’s also a rare specimen. Choosing between the 6S and 6C could boil down to either budget or cosmetics but it’s also worth bearing in mind the razor’s lifespan. Although chrome is the most popular material found in straight razors, it’s not necessarily the best option. Chrome is inert so it is less likely to rust or corrode over time. However, it does wear more easily with regular use and may eventually begin to chip. Meanwhile, stainless steel is a far more durable and robust metal. Of course, it’s not immune to rust but it is easy to maintain to prevent this from happening. In terms of longevity, a stainless steel razor is about as durable as you can have for the long term. Using stainless steel to make razors is a rather recent phenomenon that was more-or-less propagated by the Japanese firm, Feather. Yet, they’re still very rare and it’s even rarer to find one made in the United States. Therefore, if you’re looking for a razor made in the USA that will last several lifetimes to be passed down as an heirloom, the Rockwell 6S may well be for you. For the purposes of this review, I didn’t just pick out the two razors to compare. In fact, I wanted to also take a look at Rockwell’s other offerings. After all, the brand has excelled in making quality razors so it was interesting to see how they fared elsewhere. During the shave, I used both Rockwell’s razor blades and the barbershop shaving soap. As I mentioned earlier, I really liked both. Firstly, the blades were nicely coated and offered the perfect balance between a smooth and not overly-aggressive shave. Secondly, the soap provides a nice and creamy lather, which distributes evenly across the face. It’s quite thick so you’ll need a fair bit of water for the perfect lather. Whilst the scent was thoroughly refreshing, I didn’t think it smelled a lot like a barbershop. Instead, it was a very masculine fougère with overt notes of fennel and aromatics. That said, the fragrance was far from overpowering and still very pleasant. One item that I thought was particularly handy and almost indispensable was Rockwell’s own razor stand. Using this for my shave made me wonder how I managed before as it was very practical between passes. I decided to go for the gunmetal one, which matches the Rockwell 6C. Made from chromed brass, it’s a small yet very heavy chunk of metal in which you can place the razor’s handle. However, there’s also a stainless steel option available. The stand is also designed with a small hole underneath. This lets the water drain away as the razor begins to dry, which is an ideal solution to avoid the razor rusting over time. Although you shouldn’t usually leave your razor in a humid environment, I did like being able to proudly place it on the counter top to admire later. During my pre-shave shower, I also tried out the beard and body bar soap. Overall, I really liked this product and used it for my body, face and even my hair. As I don’t like the damaging properties of shampoo, I often use natural Aleppo soap so I figured I’d try this out. Made with a blend of jojoba oil, coconut oil, shea butter and activated charcoal, the soap features natural ingredients. This gives me a exhilarating and moisturising clean. Meanwhile, coffee in the soap helped exfoliate the skin. Overall, the ingredients were all quite natural. However, I did raise an eyebrow at the inclusion of titanium dioxide, which seemed somewhat out of place. Nevertheless, I’ll be sure to include this soap in my daily routine as the rest of the blend is extraordinary. It’s also a big and chunky bar unlike a lot of other beard soaps, which can be tiny. At $10, you get a hefty 6 Oz (170 g) bar, which will last quite a while. Although I’m now beardless, I couldn’t resist Rockwell’s flashy little folding comb. Made in a stylish brown colour, it features Rockwell’s decidedly rockabilly logo across the handle and above the teeth. Although I couldn’t find confirmation on the site, it appears to be made from cellulose acetate rather than plastic. I’m presuming this just off the way the shape appears to have been cut rather than moulded with no visible seams. If it’s indeed the case, it’s of a very good quality and offers great value for money at only $10 a piece. As I mentioned, I may not currently have a beard but I did keep it handy to comb my hair every now and then. The teeth are perhaps a touch short for this but it was quite effective and convenient to have on-hand. Personally, I’ve been swayed by Rockwell’s well-designed razors and products. I admit that I was originally somewhat uncertain as I usually prefer vintage blades. However, I did really have one of my most comfortable and closest shaves yet with the 6C. Therefore, I’ll be sure to hold onto mine as part of me collection for regular use in the near future. However, the 6S makes a sensational gift not only to yourself but others too. Thanks to its premium materials and exceptional packaging, it would be an ideal first razor for a son or nephew. Finally, whilst they excel in their quality razors, they also offer some other great products. For instance, I was particularly a fan of both their shaving and body soaps, which I’ll happily use in the months to come. Now that you have been thoroughly introduced to Rockwell Razors, you may like to see more of what they have to offer by visiting their official site? Furthermore, bear in mind that Rockwell Razors offer a 30-day return policy, so you can try their wares risk-free. However, I’d imagine that you’ll end up being very satisfied with the result. Reviewed by Charles-Philippe Bowles, on 22 February 2018 . "Exceptional Razors & Shaving Products. 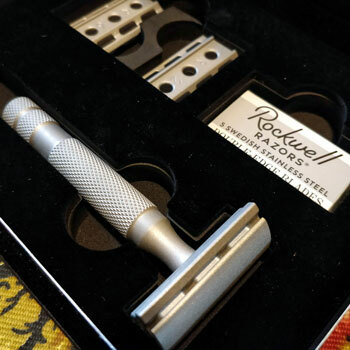 Rockwell may be a younger brand, but its ambitious and quality razors easily compete with the older established firms ." Wonderful review and awesome to see someone actually USE a product they put their name behind. Been a lurker of Rockwell for some time, might need to add one to the collection now. Many thanks for the kind words. Absolutely, I hands down love what Rockwell have contributed to shaving culture and I’m proud to associate my name with it. They’re both fantastic razors and I’ve used them since the time of writing. In fact, I had a shave this morning with just the 6C’s No4 plate and the results were excellent! I do recommend that you try them. If you do, please come back and let us know your thoughts! Enough with the “whilst”. I kept wincing, waiting for the next one. Simply another sponsored review; no one with basic intelligence bites the hand that feeds him, although objectivity is necessarily out the window. The review explains the components of the razor adequately, and certainly one is forewarned of the many parts to keep track of. To me, the advantage of adjustables is the ability to adjust on the fly, as it were. Just seems an excuse to upsell relatively inexpensive plates into an expensive package. I have 92 different types of razors, I would not, myself, be tempted by this one. Your mileage may vary. That’s quite the collection. I certainly do not have as many razors / experience with them as you seem to have, but I used this one and found it to be quite enjoyable. Charles-Philippe is currently on summer break, but I’m sure he can reply upon his return. I’m not sure where you’re from but “whilst” is pretty common in British English, which is where Paul and I grew up. Personally, I don’t think 8 instances in an article of nearly 2800 words is particularly repetitive but I’ll keep your comments in mind for the future. Although I’ve only used over 50 razors in my time compared to your 92, I stand by my conclusion. Sponsored or not, we value our integrity and won’t applaud a product that we don’t think deserves praise. I understand where you’re coming from and respect your opinion yet I presume that a number of your razors are vintage models, which are no longer produced. I’m also fond of these. For instance, I love my 1957 Gillette Super Speed and it’s my favourite. Yet, I find that Rockwell offers one the best experiences possible that you can buy brand new. Black Widow Shavette Review: The Most Aggressive Disposable Straight Razor Ever!